QUESTION: The revelations of the NSA ever since your 224 year cycle turned are amazing. Is there precedent for this before in modern history? ANSWER: History repeats because human nature never changes. After World War I there were the notorious “Palmer Raids” where the government created the great Red Scare. The U.S. Attorney general 1919 to 1921 was Alexander Mitchell Palmer (1872–1936). Palmer rounded up thousands of alleged Bolsheviks in what fueling the chaos of the period and perhaps acting as a political distraction for the economic decline 1919-1920. He was arresting anyone who disagreed with the government calling them communists. It was the “Palmer Raids” that prompted the birth of the American Civil Liberties Union (ACLU). He was arresting people solely based upon associations who took no action nor did they even participate in any protest. He deported 536 people and the ACLU freed hundreds of people. His primary achievement has been in confusing the public mind, as between the internal and the external threats of Communism. We must not confuse dissent with disloyalty. We must remember always that accusation is not proof and that conviction depends upon evidence and due process of law. We will not walk in fear, one of another. We will not be driven by fear into an age of unreason, if we dig deep in our history and our doctrine, and remember that we are not descended from fearful men … We proclaim ourselves, as indeed we are, the defenders of freedom, wherever it continues to exist in the world, but we cannot defend freedom abroad by deserting it at home. The actions of the junior Senator from Wisconsin have caused alarm and dismay amongst our allies abroad, and given considerable comfort to our enemies. And whose fault is that? Not really his. He didn’t create this situation of fear; he merely exploited it—and rather successfully. 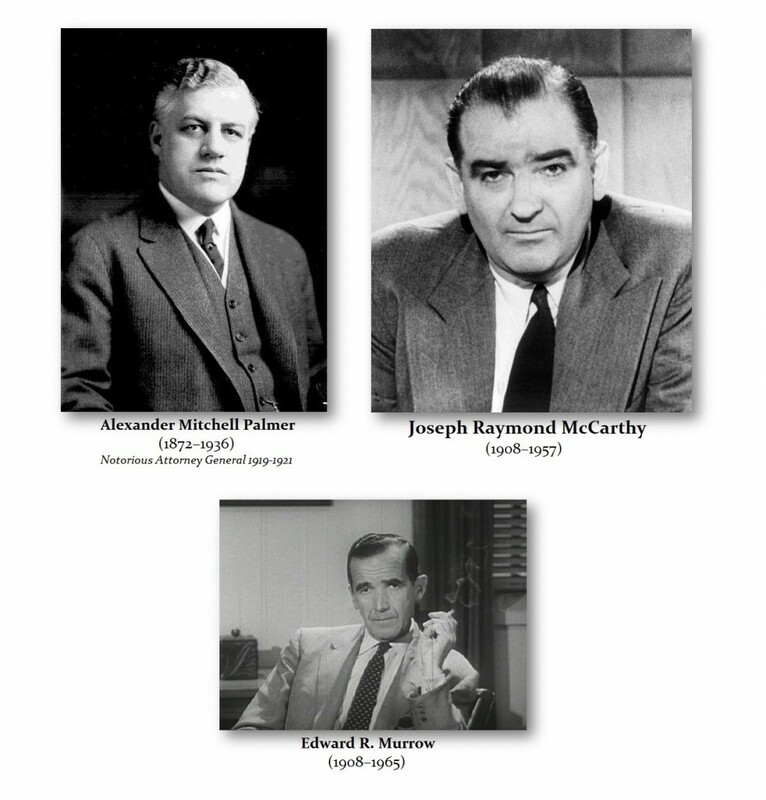 The NSA has been doing the same thing as Palmer and McCarthy. They trump-up nonsense to justify what they are doing and we see countless members of Congress lining up to support them. This is no different than the “Palmer Raids” or McCarthism. This is much worse because even the President is involved and they seek to criminally prosecute anyone who exposes the truth. There are no journalists like Murrow today. They all are cowering in the corner.